Today, vinyl siding is the number one choice of exterior cladding across the United States and Canada. In fact, U.S. Census Bureau statistics show since 1995 more homeowners side their homes with vinyl than with any other material. Vinyl siding is available in a broad palette of colors, profiles and architectural trim to assist architects, builders and homeowners in customizing their new construction and renovation designs, and can complement historical restoration projects. Whether you’re planning a neighborhood, designing or building a single house or an entire development, or remodeling an existing home, these are attributes you’ll certainly want to offer your customers. 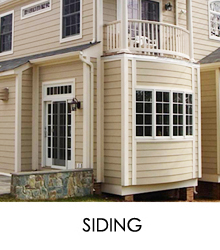 And you can – by including vinyl siding as the exterior cladding of choice. You may be surprised what you can achieve using vinyl siding, architectural trim and accessories. Vinyl siding helps create houses and neighborhoods with distinctive style and unique character that appeal to home buyers and homeowners alike. And helps build communities of undeniable attraction and lasting value. Look around. You’ll soon discover why America sides with vinyl at a rate nearly double that of any other exterior cladding material. While traditional pastel and earthy color options are still available, today’s vinyl siding offers a comprehensive array of darker color combinations including bold, rich tones like barn reds, hunter and sage greens, deep blues and more. Nearly 350 different colors are certified to meet the ASTM standards for vinyl siding color retention, so you can be sure the shades you select will resist major color changes in a variety of climates. Of course exterior cladding has to look good for today’s discerning homeowners, but it also has a vitally important job to perform — protecting a home from the elements. With the ability to withstand high winds (certified up to 110 mph or higher) and a composition that resists heat, cold and moisture, vinyl siding retains its great looks over time. Vinyl siding never needs paint. Ever. The only maintenance it will need is a simple wash with a soft cloth and garden hose to keep it looking great, a feature today’s strapped-for-time homeowners really appreciate! Unlike some other exterior cladding, vinyl siding provides exceptional rainscreening performance that reduces accumulation of water that can reach the underlying water-resistive barrier. This benefit has been recognized by the International Residential Code and International Building Code, giving vinyl siding a significant advantage over other exterior claddings that do not vent (drain) moisture. y, Howard County, Carrol County, Prince George’s County and Fairfax County, VA.